It's simple, cheap, creative, and allows me to put the recipient's name, fabric content, care instructions, and even a little cartoon on the label! 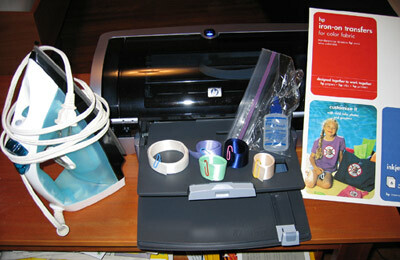 - iron-on transfers, whichever are suitable for your printer. I use the HP Iron-on Transfers for Color Fabrics . 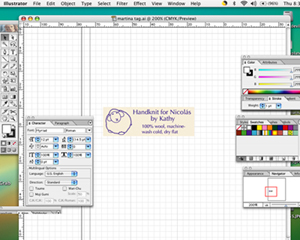 You will need to design your label using graphic software. I use Adobe Illustrator. You can also use MS Word, Paint, Photoshop Elements, and really any software where you can draw a box and write some text. Follow the instructions on your iron-on transfers. 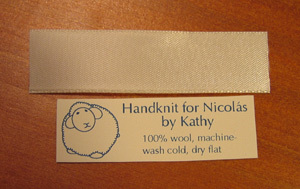 For mine, I do not need to make a mirror image: the exact box/image/text I print ends up glued to the ribbon. So, because my iron-on transfers are white, whatever areas I do not color, they will remain white. I like to match the background color of the label to the color of the ribbon, but a contrasting color could also be interesting. Your design needs to be a smidgen more narrow (in the vertical direction) than your ribbon, but basically the size that you want your label to be. You can reuse the same iron-on transfer paper over and over again. In order to be able to do that (or, in order for your printer to be able to do that), you need to print labels starting from the bottom right corner, cut them off, then work your way left, then up. I think you can fit about 3 columns and 10 rows of labels on one sheet, making the cost of each label only 5 cents! I think it's a good idea to first print your label on a plain sheet of paper to make sure it's in the correct position. 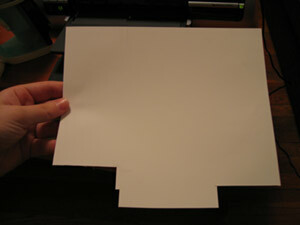 Hold the plain sheet of paper and the iron-on transfer together and up to the light to check this. 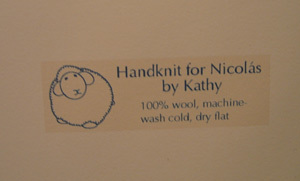 This is what the label looks like printed out. 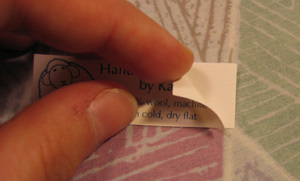 Let it dry for a minute, then use the sharpest scissors you have to cut it out... if you have a paper cutter, great. 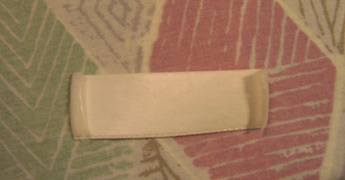 Cut a piece of ribbon about 1/2" longer than your label. You will fold the excess under. 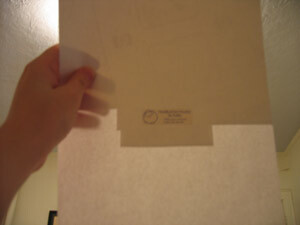 Peel off the backing of the iron-on transfer paper. You are almost ready to iron. I like to iron on a very flat, firm surface, so I spread out a pillowcase on my coffee table and iron right on it. Position the label on the ribbon precisely where you want it. 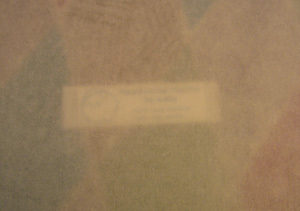 Place the overlay paper on top; make sure that the label is still properly positioned on top of the ribbon. Set your iron to the highest setting, and make sure there is no steam. Keep the iron moving, be firm, and make sure to get the entirety of the label, over and over again. As far as I know, you cannot do anything wrong by ironing for an extra-long time, but the label will peel off if you iron for too short of a time. Fold the edges of the ribbon under the label, carefully place the overlay paper on top, and repeat the ironing procedure. 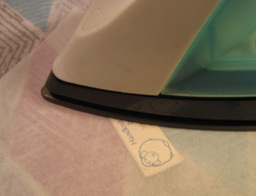 Remember: never take an iron to your naked label, always use the overlay paper in between! 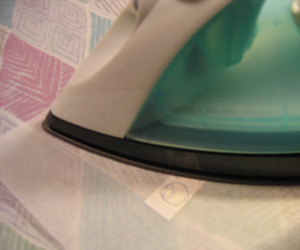 Placing the label in direct contact with the iron will ruin your label and your iron! 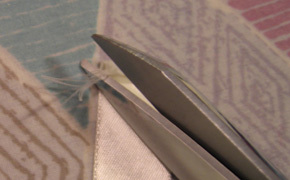 Trim any threads which have frayed, then add a drop of Fray Check to the edges (just a drop, watch that it doesn't spread all the way to the iron-on transfer). Let it dry for a few minutes. 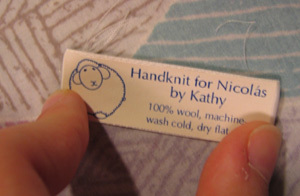 I use regular sewing thread and a needle and carefully stitch the label into the garment. The labels, from my experience, are completely machine-washable. I hope you enjoyed this little tutorial. E-mail me if you have any questions!